The biggest threats to public health in the 21st Century are chronic, not acute or episodic. This fact has major implications for how health care in the U.S. and most countries around the world is organized and delivered. It also has implications for how practitioners serve patients, as well as professional training and continuing education. Chronic diseases exact a different toll than most acute conditions. While premature death is a real threat for most people as a result of coronary artery disease, for example, most people with chronic diseases live long lives. However, their quality of life may suffer and their independence may be compromised such that they cannot enjoy the productive or fulfilling activities that they once did. 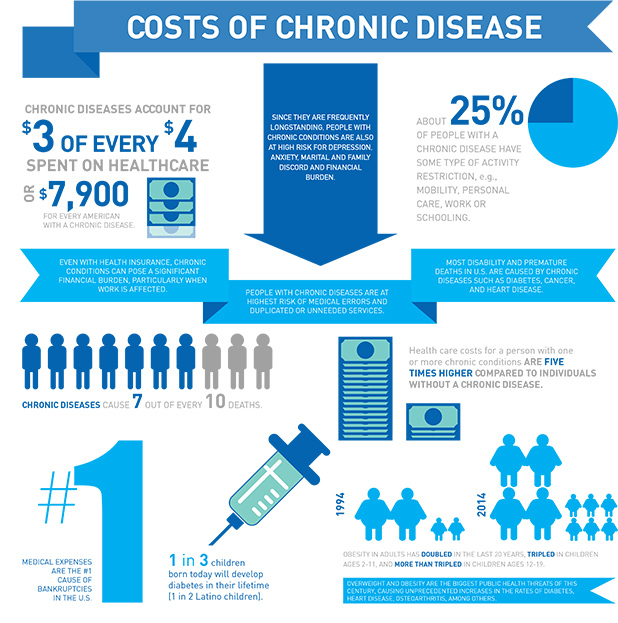 These patients also are more expensive to care for than people without chronic conditions as described in this infographic. These costs are a burden on all of us who directly or indirectly fund this care through taxes or employer expenses. While some acute conditions are the result of behaviors (high-risk behaviors such as driving without a seatbelt can increase the risk of injuries related to a motor vehicle accident, for example) behaviors are directly implicated in chronic disease. Chronic diseases are growing in prevalence largely due to the modern lifestyle which is more sedentary and marked by changes in diet from plant-based foods, to more calorie dense, simple carbohydrate and unhealthy fat laden alternatives. Additionally, the chronic disease-related complications that drive so much of the human and financial costs of chronic conditions stem from behaviors related to lifestyle, disease self-care or adherence with recommended treatments. Chronic conditions require a transformation in how health care is delivered. Care must to better organized, more proactive and patient-centered. And since an estimated 85% of avoidable health care costs are due to behaviors, everyone on the health care team is to some extent a health coach, in the sense that they are working with other members of the interdisciplinary care team and partnering with the patient to support healthy behaviors. Practitioners who serve in health management or population health improvement roles such as wellness, disease management or case management require advanced skills in health coaching since they are specifically charged with preventing adverse human and financial costs related to chronic conditions. All practitioners require training in chronic care and health behavior change.